After getting walloped by the Miami Heat in the second half earlier this week, Gregg Popovich and the San Antonio Spurs found themselves in a much tighter endgame Wednesday night against the Orlando Magic. The game was tied at 81 with about 40 seconds left in overtime. Popovich called for one of the most imaginative plays I’ve seen in this short season, and the Spurs’ perfect execution helped them beat the Magic 85-83 on the road. Let’s take a look. Tony Parker dribbles the ball up the left sideline to initiate the offense, and Tim Duncan trails the play down the center of the court. Gary Neal sets up in the strongside corner, Richard Jefferson waits on the strongside block, and Danny Green positions himself on the opposite wing. Once Duncan crosses half court, Parker swings the ball to him. Duncan dribbles toward Green, who meets Duncan halfway for a dribble handoff. 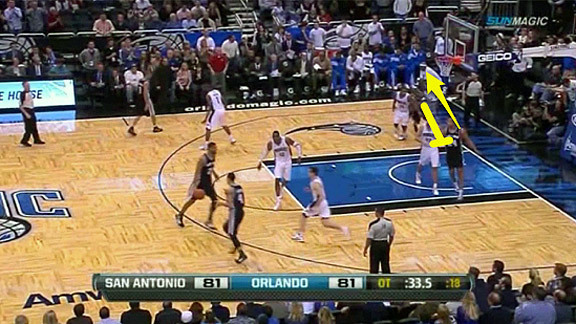 At the same time as Duncan and Neal are executing the handoff, Jefferson cuts to the other side of the lane. Neal leaves his spot in the corner and runs crosscourt to screen for Jefferson, who uses the cross screen and returns to his original position on the left block. 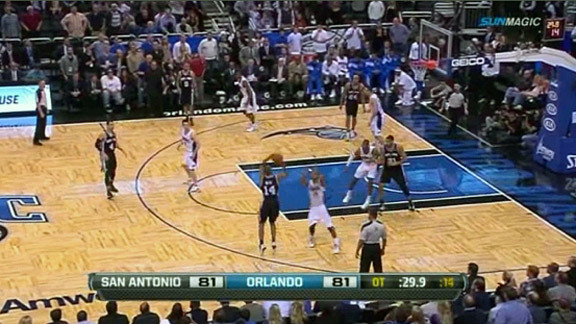 With the ball shifting to the left side of the court, the Spurs seem to be setting up Jefferson for the game winner. The Magic can’t leave him open, so when Neal sets his cross screen for Jefferson, Jameer Nelson (who was guarding Neal) hedges over to the middle to defend Jefferson while Ryan Anderson fights through the screen. This is exactly how the Spurs want Orlando to react. After Neal sets his cross screen, Duncan runs down to screen for him, and Neal comes off it looking to get to the 3-point line. Because Nelson had to hedge on the cross screen, he ends up trailing Neal, but there’s too much distance between him and his man. NBA defenders are taught to stay “attached” to the players they’re guarding when they come off screens away from the ball. 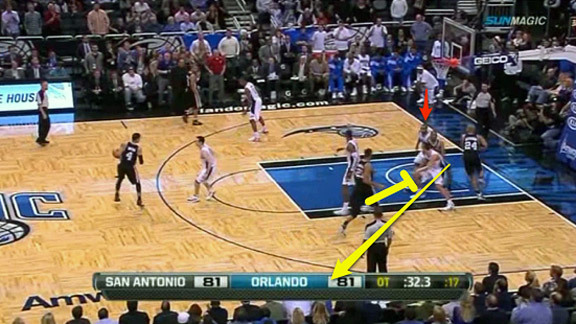 In this case, however, Popovich designed a play that made it nearly impossible for Nelson to stay close to his man. As Neal heads toward the perimeter, there is a large gap between him and Nelson. Green makes an easy pass to Neal as he squares up for a catch-and-shoot 3-point shot. Neal turns into the pass and rises to shoot all in one motion. Nelson, who is shorter than Neal to begin with, is too far behind to challenge or block the shot. Neal drains it and puts the Spurs ahead for good. 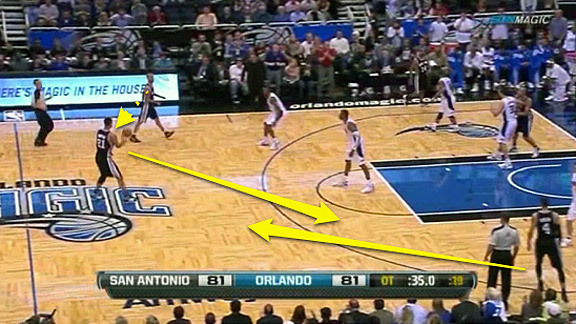 This play was a gorgeous example of the sets Popovich likes to run late in games. His teams are always using misdirection — they show the defense one threat and then use it to set up something completely different. 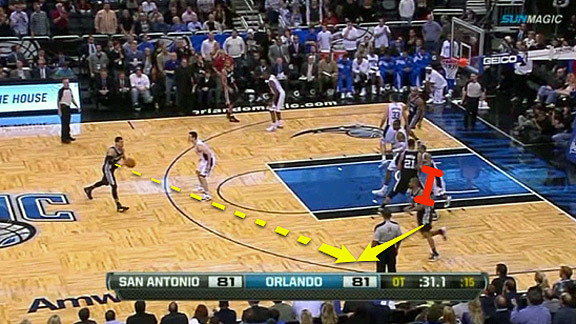 In this case, the Spurs showed a cross screen, to make Orlando think the ball was going to Jefferson on the left side. Instead, the Spurs were looking for Duncan’s pin-down screen for Neal and the ensuing 3-pointer, and by the time Nelson and the Magic figured it out, it was too late. The Spurs did something very similar to beat the Bucks almost exactly one year ago. Last night’s play was another great call by Popovich, with pinpoint execution by the five Spurs on the court.